It takes a few hours to get to Sulaimaniyah from Arbil. Streets in Iraq are excellent if a little unsafe (there are no fences separating the streets from the desert or quick death in the mountains). The road to Sulaimaniya leads through the desert and through Kirkuk. Kirkuk is not exactly the most beautiful of places and it is still a front city so I spent very little time there. 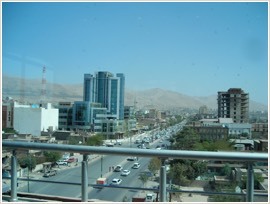 Sulaimaniyah is a city of 2 million located close to the Iranian border. It was also one of Saddam’s bases located conveniently close to two enemies, Iran and Iraqi Kurds. “You haven’t a problem” the soldier kept assuring me as he asked my driver questions. As is customary in Iraq he asked me for my religion. He made a few phone calls, my driver told me they were to other checkpoints, and then send us away and we continued to Suli. Sulaimaniyah is a beautiful city, not only compared to other Iraqi cities (Kirkuk is extremely ugly), but by anybody’s standards. There were two places I wanted to see: the archaeological museum and the muhabat (secret police) headquarters, which I knew had been used as a memorial since the days of Saddam were over. The museum was easily found. I spoke to the director and received permission to take pictures. A woman gave us a tour of the museum. 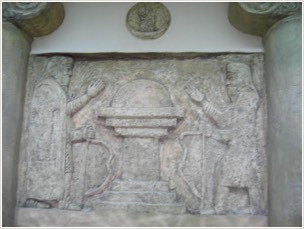 It started with this depiction of the signing of a peace treaty between the Medes (ancestors of the Kurds) and the Lydians (imagine relatives of the Hittites that looked like Greeks based in today’s western Turkey) under the auspices of Ahura Mazda (the Zoroastrian-Persian term for G-d). Surrounding the picture were images of angels. Angels are very dominant in the Zoroastrian religion, much more so than in Judaism. After we left the museum we had to find the former mukhabarat base. So we spent a happy hour in a city in the desert at the Iranian border trying to find the secret police headquarters. Plus I had forgotten the Arabic word for “secret police” and had to make a phone call to Ireland to ask a friend to look up the article where I had originally read about Suli and give us directions based on that article (The Head of the Snake by Michael Totten). When we arrived at the compound it was closed. But a few government workers sat in the guard room. We talked to them (my driver did), and they decided to let us in and show us around. Apart from a genocide memorial (see pictures below) and the cells and the gravity of the grenade-affected buildings the compound housed two galleries of pictures of Saddam’s victims, among them pictures of gas attacks against civilians (using poison gas made in a factory built by German companies as far as I was told).